© FoxNews.com Authorities say the married couple that was planning to bomb that Iranian opposition rally in Paris. A Belgian couple and an apparent Iranian diplomat were among four people arrested over the weekend in connection with a planned bomb attack at a large rally held by Iranian opposition groups and attended by President Trump's lawyer Rudy Giuliani, authorities in Brussels said Monday. [post_ads]The Iranian-heritage couple, identified only as 38-year-old Amir S. and 33-year-old Nasimeh N., were apprehended on Saturday after police stopped them and searched their car in the Woluwé-Saint-Pierre neighborhood of Brussels. Investigators found more than a pound of TATP explosives and a detonator, said Eric Van der Sijpt, spokesman for the Belgian prosecutor's office. "We can say we arrested them just in time," Van der Sijpt told The Associated Press. TATP has been used in several terror attacks in Europe in recent years, including twin bombings in Brussels that killed 32 people in 2016. Van der Sijpt added that two other men had been arrested in connection with the plot, one in France and one in Germany. The man arrested in Germany, the spokesman said, "seems to be" a diplomat attached to the Iranian embassy in Vienna, Austria. A report by Belgian broadcaster RTBF described the man as a "contact" of the arrested couple. In a statement, Giuliani praised the "fine work" of law enforcement in France and Belgium and said the foiled attack "accentuates the growing sense that the regime that is the biggest sponsor of terrorism in the world is increasingly weakened by constant large demonstrations in over 140 cities." 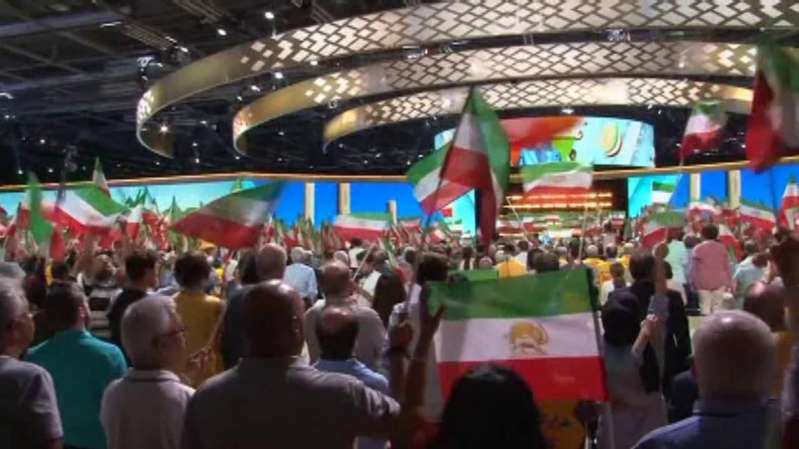 Police estimated that 25,000 people attended the rally held by the Paris-based National Council of Resistance of Iran (NCRI) in Villepinte, a suburb of the French capital. However, multiple sources said the attendance was between 80,000 and 100,000. The NCRI's leader, Maryam Rajavi, tweeted Monday that Iran's embassies must be shut down and the Tehran regime's diplomats expelled. "EU officials must question the mullahs why their answer 2 innocent ppl ... is 2 plant bombs & open fire?" Rajavi tweeted. "In the view of Iranians this regime is illegitimate & must go." She added the hashtag "#ExpelIranDiplomatTerrorists". The Iranian government reacted angrily to the arrests, with Foreign Minister Javad Zarif tweeting: "How convenient: Just as we embark on a presidential visit to Europe, an alleged Iranian operation and its 'plotters arrested. Iran unequivocally condemns all violence & terror anywhere, and is ready to work with all concerned to uncover what is a sinister false flag ploy." Iranian President Hassan Rouhani began a two-day visit to Switzerland on Monday and is expected to travel to Austria next. In addition to Giuliani, the American delegation at Saturday's rally included former House Speaker Newt Gingrich, former U.S. Ambassador to the United Nations Bill Richardson, former New Jersey Sen. Bob Toricelli, and former FBI Director Louis Freeh. Van der Sijpt said he did not know whether the planned attack specifically targeted any attendees. "All I can say is that they were planning a terrorist attack at a conference, I don't know if they were targeting somebody special," he said. The main component of the NCRI is the Mujahedeen-e-Khalq (MEK), a formerly armed group that had been on European Union and U.S. terrorism lists before being delisted from both. Trump's recent appointment of John Bolton, who spoke at a MEK rally before he became national security adviser, and Giuliani, a regular MEK headliner, are seen as moves that could strengthen the group's bid for U.S. backing. In his statement, Giuliani also praised Rajavi as a "realistic alternative to this homicidal regime." "Nothing could be worse for these misogynists than a movement seen as replacing them headed by a heroic woman," Giuliani said.